During its pre-Broadway run at the Curran Theatre,�LESTAT�grossed $4,315,293, breaking the record previously held by�Wicked. On Broadway,�LESTAT�starred�Hugh Panaro�in the title role,Carolee Carmello�as Gabrielle,�Drew Sarich�as Armand,�Jim Stanek�as Louis,�Roderick Hill�as Nicolas,�Michael Genet�as Marius and�Allison Fischer�as Claudia. 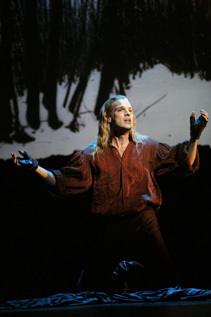 Lestat conlcuded its Broadway run on May 28, 2006. The announcement is available on�BroadwayWorld.com. The New York premiere of LESTAT was April 25th, 2006. I’m overjoyed to report that I was there on opening night, stunned and amazed, and I’m eager to tell you just exactly what I saw. But let me say this first:� I didn’t really create the character of Lestat de Lioncourt.� He lives and breathes in some nine different books that I wrote.� But how he came to be is truly something I can’t explain. So if I write here about Lestat as if he was somebody else’s baby, there’s a reason for it.� He’s been out there on his own from the start. Yes, he was based on my husband Stan -- on Stan’s vigor and beauty, on Stan’s will and Stan’s courage.� And� my son, Christopher, has grown up to be Lestat, and that’s a puzzle that commands respect. Yet Lestat is my alter ego, lover, muse and the unabashed hero of my crippled, genderless soul.� I’m in love with the guy. I prowl the world looking through his eyes from time to time.� For decades, there was nothing I couldn’t express through Lestat’s voice. So when� a production captures Lestat perfectly as this unique and thoroughly original musical by Elton John and Bernie Taupin has done,� well, I can’t mumble about it, feigning humility.�� That would be pointless. I’m too enchanted, too intoxicated, too frankly thrilled. Now back to what happened on the stage of the Palace Theater in New York last week. After years of anticipation on my part, I saw the curtain rise, and who should be there but my hero,� complete and entire from the first second, so fully realized that I am on the verge of tears. Hugh Panaro was a giant as he moved around the stage with the grace of a panther. His voice was lustrous and immense as he sang Elton John’s rich, melodic and truly glorious music.� Bernie Taupin’s brilliant lyrics got right to the point.� In essence, Lestat put it out there:� I’m young, I’m strong, I’m you! --� and I’m gonna die! Why do I say this when my hero is an immortal? When the “theme” of the musical is that he will live forever?� Because we are all both mortal and immortal, creatures locked in time, yet conceiving of eternity, and that is what the play was most certainly about. I knew instantly the production was a triumph; and to the final curtain it never let me down.� In those first few moments there was an explosion: here was the bravery, the skill, the power -- to deliver a true adaptation of something I’d somehow managed to unearth in my long and frantic excavations of the mind. Effortlessly and briskly the musical moved the hero into the presence of Carolee Carmello as Gabrielle, Lestat’s mother, and with astonishing power this actress worked a curious miracle, wringing a depth� from that character which was beyond what I myself had ever understood.� Yet this was Gabrielle -- and this was Gabrielle and Lestat together. At once they�� transcended the mother and son bond; the alchemy of metaphor� was unleashing a muted fury.� These were any two people who had loved each other unselfishly and yet with total and consuming need.� The heat was white. The audience was spellbound. You could feel the exhilaration in the theater.� The great bursts of applause had begun. And we were traveling swiftly into an alternative world in which our most pedestrian concerns and our greatest anguish could be confessed and examined to their very roots. The night went on like that, with surprise after surprise, depths yielding to depths, with members of the audience often in tears. Roderick Hill was vulnerable, seductive and heartbreaking as Lestat’s boyhood friend Nicolas.� Allison Fischer brought down the house as the child Vampire Claudia, a woman trapped forever in a little girl’s body, unschooled in compassion, yet steeped in pain. Jim Stanek was the embodiment of Lestat’s tragic grief-stricken partner, Louis. As the arch antagonist, the Satan of Lestat’s trials, Drew Sarich� was� deeply engaging� and� mystifyingly sympathetic.� Marius, the ancient one, came� to quiet strength in the person of Michael Genet, offering Lestat wisdom instead of despair. Every voice in the ensemble was tremendous, flexible and shamelessly gorgeous;� song after lovely song� broke forth. The� plot, direction, story, and staging all moved with irresistible timing thanks to the genius of Rob Roth and Linda Woolverton -- until we were at last awakened by the final curtain from a hypnotic spell.� I didn’t want this to end. I wanted to be with my beloved Lestat. A celebratory joy had gripped the theater.� I’d witnessed a triumph all right.� It was one of the happiest nights of my entire life. Lestat is the essence of the romantic man of sensibility, privileging his insight and his will to survive�� over the voices of authority that would relegate him to the realm of the damned. In him, the vampire is a metaphor for the outsider in all of us, the predator in all of us, the alienated one and the rebellious� one, the being who� wants to live forever and yet be held tightly in some one’s loving and forgiving arms. To create a musical this pure and this� committed to the big questions is to fly in the face of the weary world at every turn. LESTAT makes no concessions whatsoever to cynicism, irony, or camp. The ambition and the achievement� are enormous here. The character and the play reach directly for the heart of the audience and will settle for nothing less. Is it any wonder that every song is a show stopper? That cries accompany the exuberant clapping over and over again?� That standing ovations greet the final bows?�� You leave the theater grateful for the nerve that went into this work knowing that you will never be able to fully� analyze how and why these strange, eccentric and extreme characters changed� your soul. That’s what I saw and� felt on Tuesday April 25th, 2006 at the premiere of this musical.� There’s no doubt in my mind that readers far and wide will love it and embrace it,� no doubt that Lestat has moved from literature to legend in a� divine theatrical incarnation in my own time. Important Note: The reader letters and images on this page have been reprinted with permission from the authors and/or copyright holders. These permissions extend only to annerice.com and are not transferrable. Therefore, no reader letter or image on this page may be copied, reproduced, posted, excerpted, or otherwise employed outside of annerice.com, unless done so by the author or with the author's express permission to the displaying entity. I have been waiting for this broadway play longer than I can remember. It was breath taking. Lestat and Claudie did the most amazing job a long with Elton John and those who brought this together. I must also comment it was also visually beautiful. I respect your writing and the depths you have reached with the courage to write about Christ the Lord. I look forward to the novels that follow. I went with my family to see Lestat on Friday May 12,2006. It was wonderful. When will there be a cast recording? I want to remember the feelings I had while watching the show. Very moving especially Claudias performance. Looking forward to the cast recording soon please. I was a lucky fan who was able to see Lestat on it's first run preview in NYC and, as a long time fan of Lestat, I was moved to tears after watching my vision of Lestat live and "real" in front of me. I couldn't get enough. It touched me so much that i am making a second trip from South Carolina to see Lestat again in NYC. It's like a found a piece of my soul there and having to abandon it to come back to my normal life was heartbreaking. Lestat and his story have reivived a piece of my life i thought was long gone. I feel his anguish and his love. I feel as if my heart beats in time with his. He has become almost a real figure to me. And I'll tell you this, if it were possible ever to meet Lestat on the street and he offered me the "dark gift" i wouldn't hesitate. These Chronicles have given me an outlet in my life and the play only magnified it. My trip to see Lestat was also my first Broadway show and my first trip to NYC itself. I dont think i'll be able to stay away from NYC now because New York will always be Lestat to me. Thank you for putting your wonderful stories into the hands of people who seem to care about it as much as I do. The play is beautifully done, the music is extremely moving and the actors are perfect. Poor Hugh, though, he will always be Lestat incarniate. It was such a pleasure to be a part of something so magical. I am on a countdown till June when i get to partake in the fantasy once more. Again, thank you for your courage to cross so many lines in the making of this character. And i was so thrilled to hear that you loved the play. To me, that was the upmost compliment. Your letter to the fans on your website was beautiful. Your writing always gives me chills. I think you are a beautiful writer and a beautiful soul. Best of life to you. I was in NYC April 20-23. During that short time, I saw 5 shows: The Color Purple, The Odd Couple, The Drowsy Chaperone, Lestat, and Sweeney Todd (in that order). My personal favorite was Lestat. I could go into detail as to why, but I'll simply say that the characters and the music moved me more than the others. In April 2005 I made a similar whirlwind trip to see shows and my favorite on Broadway--during that trip--was Light in Piazza. The year before that, my favorite was Avenue Q. I have varied interests. Did it help my appreciation that I've read your books? Perhaps, but my cousin (with a much more extensive background in music and theatre than I could ever hope to have--but no prior acquaintance with your characters) also loved Lestat. Kudos and thanks to all for a fine show. Communication and Performing Arts Dept. Much of the recent critical disdain for Lestat has centered around the unlikely notion of making yet another musical about vampires. The idea has failed twice before in recent years, what makes this one any different, right? It?s also not exactly something that you might want to take the kids to either, is it? Despite my fear of having to endure blood and bats, Lestat turned out to be quite different from what I might have imagined. The music is both complex yet uniquely Elton. The set is minimalist which properly puts the emphasis where it belongs. But there?s more. This is also a very intelligent musical. At some point in every man's life, there comes a time when he confronts his mortality and asks the big questions such as "why am I here?" and "who will remember me?" Some artists amongst us have the comfort of knowing that their art will go on living far beyond their lifetime, a reality that surely the musical collaborators must now be willing to acknowledge. For the rest of us, there is religion, a source of the kind of reassurance we need - that we too will not be forgotten. It seems that there is an escape hatch for those who are neither religious nor artistic. Enter Anne Rice. The problem of course is that not all of the lucky few make a conscious choice to "die young and live forever," a source for endless philosophical discussion, for example, must all vampires by nature be bad? Musically, Lestat has three outstanding songs, "Right Before My Eyes," "I Want More" sung beautifully by Allison Fischer as Claudia, and "Sail Me Away." While the other songs have the typical sing-song quality of many Broadway musical numbers, they are also Elton John numbers, and that brings its own unique character to them, even if not as memorable. Sometimes Elton's music requires a second listen to fully appreciate. Lyrically, Lestat has so much ground to cover that Taupin has to use every word very carefully to push the story along. This gave Elton quite a job, and as anyone who knows how they write together, it's Bernie's words which really set the tone and feel for the musical result. Predictably, some of the early and middle pieces are by word and necessity rather dark and complex, generating powerful feelings for those familiar with Elton's work while at the same time laying the foundation for the groundswell of emotion in the more powerful and memorable numbers. This is Elton's fourth musical, and while it's a first for Bernie, it's an artistic achievement in bringing something of this intellectual caliber to the musical stage. The choice speaks volumes about the artistic taste of the musical collaborators. Far from the camp "gay vampire" musical some might suggest, this is a smart musical that may live or die on word of mouth no thanks to the thrashing it's received in the papers. Let's hope that word of mouth keeps it around a while, at least long enough for the public to appreciate its crimson beauty. As a long-time fan of yours, I was anxious and excited for Christ the Lord to come out. Would I like it? Would I be disappointed? Would it live up to my expectations?? I couldn’t believe I felt all these mixed emotions surrounding this work, as a simple fan. But, ultimately, I decided what I enjoy most about your work is the brilliant writing, the historical accuracy and detail, AND without doubt, this would come through in Christ the Lord. I have to admit, the first 3 chapters were a “transition time” for me, getting comfortable with a new voice in this work. But, it sucked me in like a whirlpool, slowly at first, and then by the last few chapters, I didn’t want it to end! I read the last sentence with the desire to read more. So there you go, I can hardly wait for the next book to arrive in my hands. Go Anne Go! This past weekend, I was privileged to attend the opening of Lestat at the Curran Theatre in San Francisco. I was completely enchanted and brought to tears; I loved every second of it!! I heard through the grapevine that you attended, although I did not see you. My brother is a dresser on the show and gave me a tour of the backstage, AND showed me all the costumes!! I hope you were able to see the costumes in all their exquisite detail. Personally, I enjoyed seeing your work onstage, more than in the movies. And to have it set to the lyrics and music of Bernie Taupin and Elton John is simply a dream come true for this fan! Anne, let me thank you for sharing your Gift with us.